I have been obsessed with making my own infused tea using leftover fresh herbs on my pantry. Brewing herbs into tea is a great solution to finish off the herbs easily and quickly. This time, I had leftover thyme and lemon on my pantry after making the previous Lemon and Thyme Yogurt Bundt Cake. Since it has been so hot here over the past few weeks, I thought some Thyme Lemonade would help cool things down a bit. Thyme belongs to the mint family of plants. It has a lovely earthy flavor with lemony, minty, and piney tones. Aside from its therapeutic uses, drinking thyme tea regularly can beneficial to your health thanks to its abundance of antioxidants, vitamins, and minerals. Thyme has antiseptic and antibiotic qualities, making it a great remedy for colds and coughs. It works well for congestion and chest colds because of its expectorant properties. It helps break up mucus and has even been used to assist with respiratory-related illnesses. Given that thyme is a great source of vitamins C and antioxidants, it is ideal boost to the immune system, helping to relieve cold and flu symptoms quickly. Vitamin C can stimulate the production of white blood cells, while powerful antioxidants like thymol and apigenin help relieve oxidative stress by neutralizing free radicals produced by the body. Thyme has excellent antibacterial properties, which is why it is very effective in fighting off acne-causing bacteria. Its antibacterial effect proved stronger than that of standard concentrations of benzoyl peroxide, the active ingredient in most acne creams and washes. If you are suffering from an upset stomach, nausea, constipation, bloating or cramping, thyme tea may be the perfect remedy. Thymol, an active compound in thyme, may help manage inflammation by suppressing certain inflammatory pathways. The combination of thyme’s anti-inflammatory and anti-oxidant properties helps in the prevention of chronic inflammation, which is the primary cause of cardiovascular diseases. Thyme leaves are rich in potassium, which is an important component of cell and body fluids that helps in controlling heart rate and blood pressure. Thyme extracts have also been known to help reduce blood pressure in situations involving hypertension. Thyme is very effective at eliminating menstrual cramps due to the anti-spasmodic effects of certain active compounds. This tea can also help eliminate the pain and discomfort of menstruation, and even improve other side effects, such as mood swings. Similar to other herbs, thyme has a few side effects too. Thymol and carvacrol in thyme can cause irritation of the mucus membranes in people who are sensitive. Since thyme induces menstruation, pregnant women should avoid drinking thyme tea, for fear of possible miscarriages. Also, people on anti-thyroid and thyroid replacement medications should avoid using thyme. It is known to inversely react with these medications, hindering their functions. You should always consult with your doctor before adding a new herbal tea to your daily routine. Aside from its therapeutic uses, thyme is beneficial to your health thanks to its abundance of antioxidants, vitamins, and minerals. Combine sugar, water, and thyme sprigs in a small saucepan. Bring mixture to a boil over medium-high, stirring constantly until sugar dissolves. Remove from heat, and cool to room temperature. Remove and discard thyme sprigs. You can store in an airtight container in refrigerator up to 2 weeks. Stir together lemon juice, water, and thyme simple syrup. Add more syrup depending on taste preference. Serve chilled with ice. 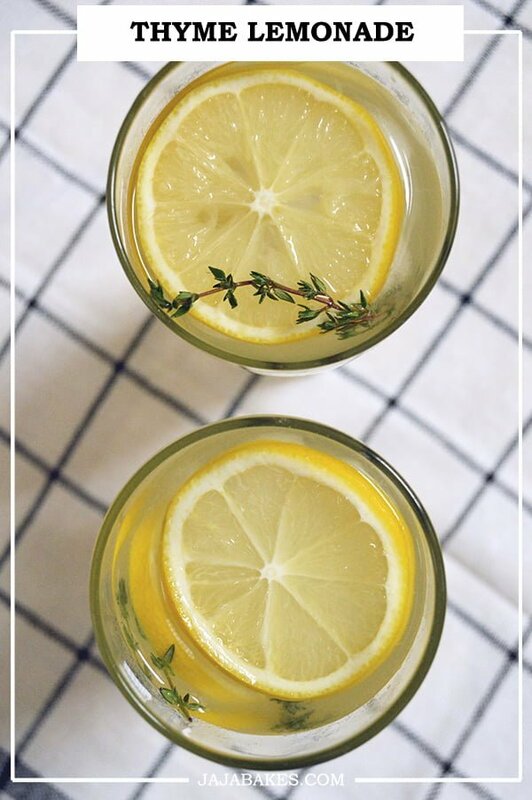 Garnish with a slice of lemon and a sprig of thyme.